Last week, we experienced our first snowfall of the season, and it caught many of us off guard! Although snow may make you want to get cozy by the fire and focus on the upcoming holidays, that sudden nor’easter also serves as a reminder of the potential hazards that go hand in hand with a seasonal storm. You may already be taking action on the basics by checking your car’s tires, stocking up on deicer for your driveway, and pulling the shovel out of the shed. However, one item that often goes overlooked is our trees! 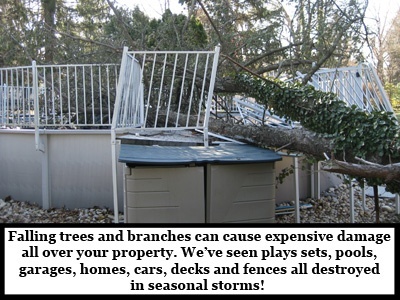 High winds, heavy rainfall, and dips in the temperature can cause the trees on your property to snap, break and uproot; causing dangerous and expensive property damage! While it’s impossible to predict what will happen in the next storm, there are actions you can take to greatly reduce your risk of tree damage. After big storms, we usually hear frustrated customers ask “What could I have done to prevent storm damage?” Last winter, after a particularly awful snowstorm, many properties along Washington Lane in Huntingdon Valley suffered extensive storm damage. However, one property, owned by a Giroud Tree & Lawn customer, escaped practically unscathed! Having your trees and shrubs inspected on a regular basis by a Giroud ISA Certified Arborist is the best way to give them a fighting chance against stormy weather. A Certified Arborist can spot hidden dangers that may not be obvious to you! They know the signs of insect damage, disease, weak root systems, overextended branches, and stress cracks in trunks, just to name a few dangers. 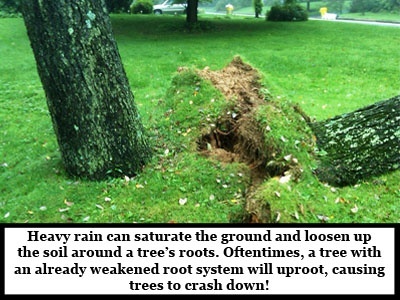 Tree root systems can be fertilized to strengthen the roots and make them better able to withstand soaking rains, heavy snow and high winds. Cracked trees can be bolted or cabled to ease the pressure from heavy limbs and leaders. Branches can be pruned to prevent property damage and injury to people below from falling deadwood. Pruning also promotes healthy growth going forward. Treat insect or disease problems before they cause serious damage and weaken your tree. If you think storm damage can’t happen on your property, think again! Our Arborists have seen some pretty wild situations, and sometimes it can strike when you don’t expect it all! Check out our video of a large Oak Tree that fell in Elkins Park! 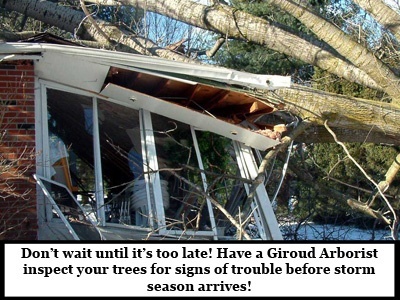 If you experience an emergency on your property, Giroud Tree and Lawn can help! We always have an Arborist on Call. Dial 215-682-7704, day or night! The only way to know for sure that your trees and shrubs are healthy and safe is to have them closely inspected by an ISA Certified Arborist. Giroud Tree and Lawn offers FREE inspections all year long. Your Giroud ISA Certified Arborist will assess every tree and shrub on your property and make recommendations to help prevent storm damage. Extensive field experience: Performing all types of tree service and/or lawn care to our exacting standards for at least 3 years. ISA Arborist Certification: Achieving ISA Arborist Certification which is awarded by the International Society of Arboriculture after passing a 12 part exam developed by the nation’s leading experts. Continuing Education: Earning a minimum of 30 credits every 3 years to learn the latest techniques and research. Commitment to Giroud Values: Receiving top ratings from our clients for honesty, integrity and outstanding service. It all Starts with a Pre-Storm Property Inspection. Call 215-682-7704 to schedule your FREE appointment today! 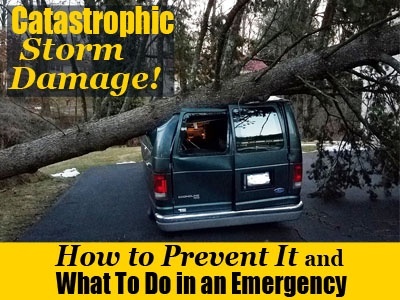 Catastrophic Storm Damage: How to Prevent it and What to do in an Emergency Overall rating:	4.8 out of 5 based on 2621 reviews.